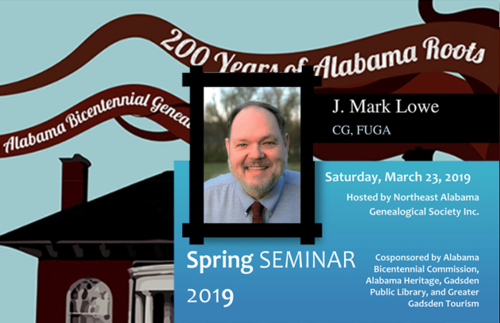 20th Annual Seminar of Northeast Alabama Genealogical Society Inc. Presenter: J. Mark Lowe, CG, FUGA Family Trees: Build One or Cut Them Down : Understand the advantages of creating a public family tree, and what you should and should not include. Learn how to deal with incorrect or unsubstantiated information. Finding, Locating, and Using Online Manuscripts : Records about families which moved or those individuals and neighbors back East are also often elusive, but may hold hidden treasure for the persistent researcher. Discover the people with whom they worked, prayed, fought, and married. Live or Webinar: Learning More About Genealogical Resources : Today's technology allows us to learn from resources far away from our home base. Learn what's available, how to find the media, and where you are most likely to find the right answers. Ten Tools You Need Today : These ten bookstools or web resources are needed by every family researcher. Learn about building your reference shelf for genealogical research, and how to use these handy references to move your research to the next level. There is parking available at the back of the Civic Center off of 6th St.
$30 if registered by early bird deadline Wednesday, March 13. Registration after March 13 and at the door will be $35.